As an employee how I can change my notification preferences? For changing your notification preferences you have to go to your profile and click on "Notification preferences". 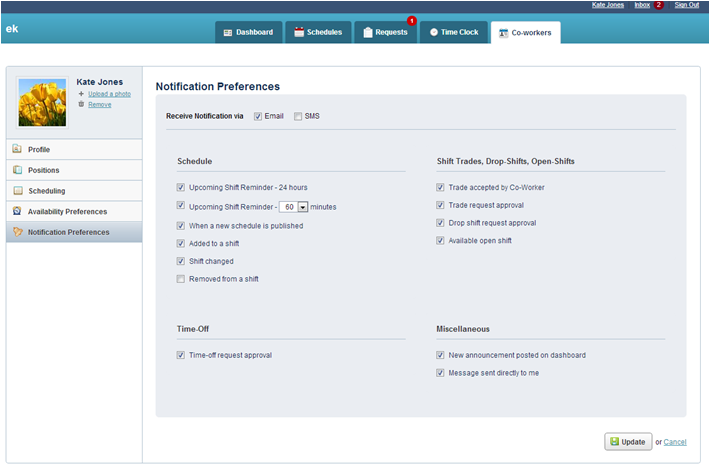 From there you can change the settings for Email and SMS notification. If your manager hasn’t allowed employees to update their profile, you will not be able to do it. In this case please contact your manager to update your notification preferences or to visit the settings section and enable the option for "Allow employees to update their profile". This will then allow you to update your notification preferences.